Rio de Janeiro, the carnival city. Picturesque views, beautiful beaches, parties and sun are just a few of the features this city has to offer to visitors. Dedicated to fun, debauchery and beauty, this city is nothing but fantastic! 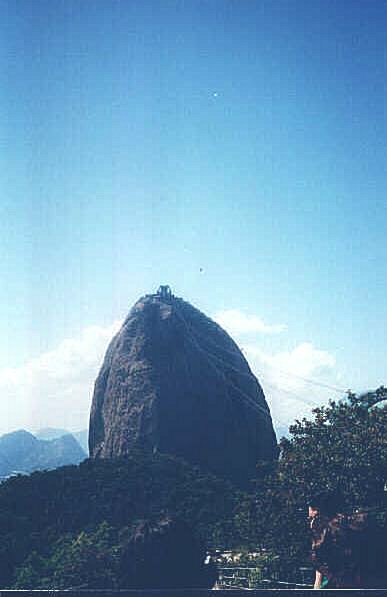 This boulder like mountain called Pao de AÇucar or Sugarloaf in English, has a cable car to take you to the top and enjoy the incredible views of the city of Rio. At the top there are plenty of photo opportunities and a gift shop for souvenirs. 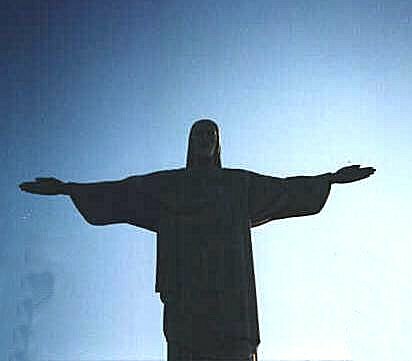 The statue of Christ the Redeemer or Jesus as it is commonly referred to is a must see for any visitor to Rio. You'll take a small train to the top of this mountain where a huge statue of the son of God is there to amaze you. You'll have splendid views over Rio and the nearby sea while being able to enjoy a drink in the bar at the top. These world famous beaches stretch for as long as the eye can see. There you can enjoy the turquoise water, catch some rays and sip on a coconut while the locals play beach soccer in front of you. This soccer stadium is the biggest in the world and you'll soon realise why. Brazilians are mad about "futebol" and the sport may be the road to riches for many of the country's impoverished. If you get a chance to catch a game you'll enjoy the sound of the samba drums and an unforgettable experience. The Nove Cathedral of Rio de Janeiro is not from the old school of Christian architecture and is certainly impressive. It's conical architecture and modern interior are what distinguish it from other classical church structures and though it may not please everyone, it is an interesting monument. The XVIIIth century church of Nossa Senhora da Candelaria is older looking by Rio standards and is impressive with it's grandeur, bell tower and dome. The square is named after the day the Republic of Brazil was created in 1899 and is well located to visit many of Rio's other attractions. From here you can visit the Paco Imperial, the Naval museum and the Igreja de Nossa Senhora do Carmo da Antiga Se, formerly the city's cathedral. Rio's lagoon is the place to watch Rio's fun lovers enjoy a stroll, bike or rollerblade around the lagoon. A great way to see the city, the local fauna and flora or the surrounding area, organised tours will show you the highlights of Rio. For those of you brave enough to enter the famous "Favelas" or shantytowns, you can book a tour of these unplanned communities. Here you will see how Rio's more disadvantaged cope with their daily lives. There are heaps of beaches to choose from in Rio. 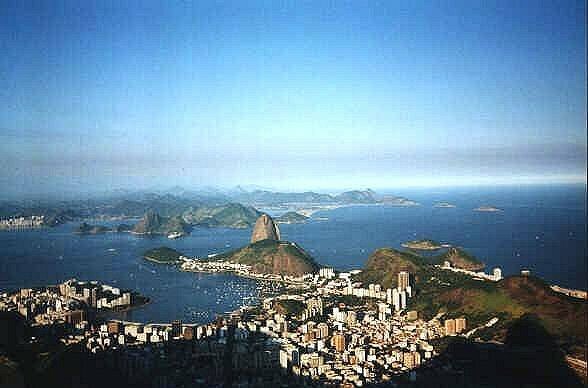 The most notable are Ipanema and Copacabana. Other notable beaches are called Leme, Urca, Flamengo, Batofogo and Leblon. If you are looking for cleaner beaches avoid Botafogo and Flamengo. While on one of the many beaches that line the city coast you may want to try some of the beach vendors' food and drinks. On a scorching day, a nice "Coco Gelado" or iced coconut will quench your thirst and refresh you. The road that stretches along the Copacabana and Ipanema has plenty of bars and restaurants to keep you busy for well over a month. If you are a man, don't be surprised at the amount of "ladies of the night" approaching you. It's not that you are good looking, it's that you have a wallet full of money and they would like to help you unload some of it. Beware! Catch a taxi to any one of the city's large shopping centres, particularly convenient for this is Rio Sul near Copacabana. With the exchange rate going your way, you could well find a few bargains. At Maracana Stadium you'll be treated to a Brazilian display of "futebol". Built for the World Cup of 1950, the home team, Flamengo, will treat you to a display of Brazilian flair. Cariocas are known for their social lives and Rio's nightlife is a diverse and dynamic entity on it's own. You can go to a Club, Samba show or enjoy some of the many bars that may or may not have live music depending on the day of the week. For those of you in search of the ultimate party, you will want to visit Rio during Carnaval. The Carnival takes place 14 days before lent and prices for flights, hotels and anything to do with tourism are high but are worth it for the experience of a lifetime at Carnival. A traditional dish of beans, sausages and rice is served in several separate dishes and tasty. This will fill the hungriest of tourists!! This meat lover's feast is very special and there are many restaurants serving this style of meal. Waiters will come to your table throughout the evening offering tastes from a variety of dishes ranging from ham, roast lamb, chicken, sausages and vegetables. Served well chilled, at the beach or on the street, this peculiar drink will satisfy your thirst on the hottest of days. Makes for a very interesting photo opportunity. Caipirinha is made with cachaca, Brazil's national drink which is a sugar liquor. The ingredients for the drink are lime, lots of ice, water and additional sugar. Be careful it is very strong and not to be overdone. Brazilian beer is excellent and served extra cold, perfect during those hot summer days. Among the better known brands are Brahma, Antartica and Bavaria. There are loads of hostels around town. Prices vary from hostel to hostel but are generally affordable. Search for and book a hostel in Rio de Janeiro. You can find excellent hotels in Rio de Janeiro. Many of the main hotel sites will have listings for you in Rio de Janeiro. Find Rio Hotels. There are two significant ariports in Rio, Santos Dumont for domestic flights and the international airport on Galeao. From the airports you can take a bus to your hotel called "executivo buses" or catch a taxi. Whichever you prefer but it should be noted that if you arrived in the wee hours, your only option is a taxi. Before you depart Rio on your return home be sure to have enough money to cover the departure tax which is now in excess of $US 36. Rio's safest form of transportation counts two lines serving the city. The metro is clean, safe and air conditioned. You can find information on the Rio de Janeiro Metro by visiting www.metrorio.com.br. Rio's main bus station is called Novo Rio Rodoviaria and this is where all incoming buses will go to on your arrival in Rio. From there, you can take public transport or a taxi to your final destination. Rio's public buses run until midnight and are quite common but if you are afraid of getting lost or being pickpocketed it is best to avoid them. The best way to get around Rio de Janeiro is by taxi. Although not expensive, they aren't cheap either. Don't be too worried if they don't stop at red lights late at night. Its standard practice in Brazil so as to avoid any local crooks in the night. The best way to see the city's sights is by tour bus. This way, you avoid having to dodge the traffic, worry about thieves and find your own way. By far the safest way around! Driving in Rio de Janeiro can be hectic, especially at night. Beware of locals burning red lights. Rio's residents, known as cariocas, play hard and work soft. It's not hard to see why after having visited the city. With so much fun and beauty at hand, it's hard to put any time towards tedious tasks. Although there is no need to be paranoid, do beware of the locals if you are lost in a "strange" part of town. They may have big smiles but that is because they are about to relieve you of your wallet. That said, Rio de Janeiro is a safe city for those who look after themselves. Locals don't walk down dark alleys at night, nor should you.